Father Felimon Mikhail was born in Fayoum, Egypt, 1939. He earned a Medical degree in 1961 from Ain Shams University in Cairo, a Diploma General Surgery in 1968 and a Diploma in Orthopedic Surgery in 1971. Until his ordination he worked in the Egyptian Army as a surgeon and in Helwan Orthopedic Hospital in a suburb of Cairo. He served as a Sunday School teacher and later as the head of Sunday School at St. George Church in Manshiat El Sadr, Cairo. He was ordained to the priesthood on November 19, 1972 by His Holiness Pope Shenouda III and later as a Hegumen on September 19, 1975 by His Holiness Pope Shenouda III. 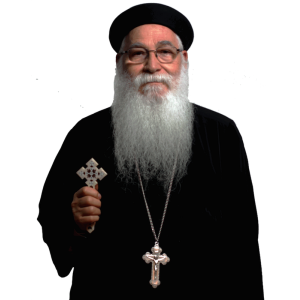 He served as a priest at St. Mary and St. Athanasius Church in Medinat Nasr, Cairo, 1972-1975. nnHe came to serve at St. Mark Church in Los Angeles from September 1975 to November 1977, before returning to his church in Cairo. He came back to California in July 1986 to serve at Archangel Michael until present. He has been instrumental in overseeing Pope Shenouda III Coptic Seminary since it opened its doors in November 1989. He also helped in the establishment of other churches in Orange County. He is the Secretary of the Diocese Clergy Synod.